The View this week is from someone whom I have, admittedly, been getting to know kind of slowly. is sweet, yes, but also someone you can easily respect. I like to think my view of this world has been through a window. When I was a teenager, quite lost and broken- living through the tumultuous years of attempting to navigate this world, I wrote a lot of music. This was my place of purpose and quiet contemplation. My songs were beacons of safety, where I spent hours upon hours at the piano at home during high school and locked in the music hall practice rooms at Ohio University. I would pour my heart out on the keys and sing until my angst would ease. Everyone in the School of Music knew not to enter into my place of sacred sanctuary. All the musicians who practiced in the other countless practice rooms and various halls, steered clear of my room that bellowed sweet tones and thundering rhythms that echoed through the building endlessly. This is where I lived. In college, I always picked the room with two windows that I could look out as I wrote and played and cried and prayed. I would play my freshly composed piece of me over and over again, until I felt cleansed of the impurities that invaded my heart, or liberated from having released the passion that needed a voice. I would linger on until I couldn’t play another note or sing another verse. I used music as my outlet and my saving grace for years. I needed somewhere to let it all out, and it had found it’s way through the beauty and beating of carefully formed notes and profoundly placed words. I always felt a sense of pride and comfort in this part of me, as I knew God had given me this gift to somehow define who I was in this life. I used my writing to firmly form my identity, and I still do to this day. I think back to almost thirty years ago, when I wrote about My Window… and I realize that the frame from where I view life and this world we live in has remained the same. And even shattered to pieces. Through the ebb and flow of life’s seasons of living. But I somehow carefully placed each splintered piece of glass back together again in the frame that was my constant state of hope, faith and light. I believe we all have windows from which we view life, people, and ourselves. 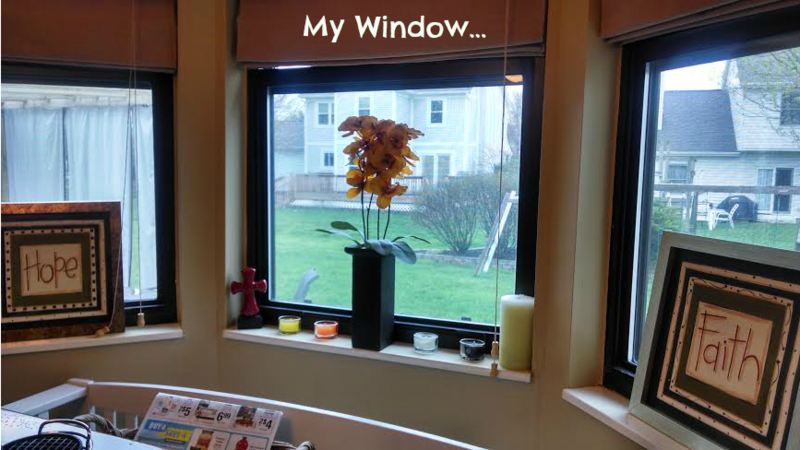 I believe our windows can change and modify to adjust to life’s barriers and burdens and blessings. The glass we peer through can modulate into something altogether different- through time, and experience, and encounters with others. The framework of our perception can be ever so vulnerable and vast. And yet, if its foundation is solidified within us, it can be impenetrable. The waves of life’s water that hit it over and over again may either strengthen the borders or break it down. I have been witness to both in many people I know well. It fascinates me, how life views can shift under circumstances that penetrate us so deeply- A window that once was, may be tarnished with bitter resentment and distrust or shine with deeper clarity of truth that had yet been revealed. They see life and people with a new purpose and a new perspective. Could you look through my window? And see what I can see? And you will find what’s in their eyes. And wider than the river’s flow. And you’ll feel pain and all the fear. You’ll create the need to care. On love and even war. "Beautiful" and "inspiring" is really all I can add.